As the temperature has risen recently here in London we have found ourselves embracing the glorious sunshine and reaching for products that can give us a natural looking radiance. This week we delve into the science behind our Illuminating Perfecting Skin Polish, and learn how it can help you achieve glowing, flawless skin. Gone are the days of harsh facial scrubs; this non-abrasive, ultra-fine formula is suited to all skin types and provides delicate, yet effective exfoliation. Containing active ingredients that work alongside each other to boost radiance, clear pores and protect the skin, this polish is no mere scrub. With all of us leading hectic lifestyles, it is often easy to forget this step in your skincare routine, but there are many benefits to exfoliating regularly. Our Skin Polish acts to even out skin tone and clear pores by using micro-granule Rice Powder. This clever ingredient acts to gently buff the skin, removing dead skin cells to reveal softer skin with a more youthful appearance. The exfoliating properties of Rice Powder encourage cell regeneration, helping to reduce the appearance of wrinkles, blemishes and pigmentation, leaving the skin looking refreshed and glowing – making this polish perfect for pre-event pampering! It features Red Grape extract, sourced from Shemakhi, a historical region west of Baku that is famed for its extensive vineyards. Red Grape extract is a natural ingredient that contains Resveratrol, a powerful antioxidant that helps to maintain the health of the skin and protect and repair free-radical damage. It also contains AHA (alpha hydroxyl acid), which exfoliates the top layer of skin, helping to promote softer and smoother skin and the restoration of moisture. 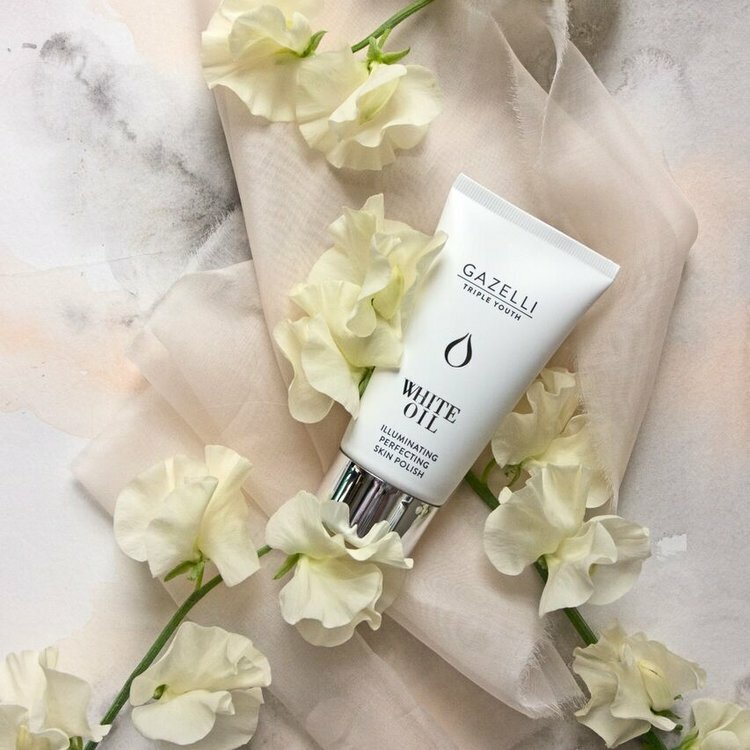 As with all products in the Triple Youth range, the Illuminating Skin Polish also contains our hero ingredient, Gazelli White Oil™. This exclusive and naturally occurring ingredient is unique to Gazelli and acts to increase metabolic processes at cellular level, improving the skin’s ability to regenerate itself and absorb nutrients and oxygen. This increases the circulation of oxygen, which will leave your skin with a natural fresh glow. For a deep cleansing treatment to leave your skin feeling thoroughly rejuvenated, we recommend mixing a pea-sized amount of the Illuminating Skin Polish with the Skin Balancing Cleanser and massaging gently into the skin. Rinse away the residue, and your skin will not only feel smoother, but will also look more radiant. For a mini facial, finish off by applying the Ultimate Firming Serum to help lift and tighten the skin. The fresh scent and creamy texture make this luxurious skin polish an ease to use and it has quickly become a firm favorite at Gazelli HQ. Whether you are new to exfoliation, or just feel like discovering a new way to boost your skin’s radiance, the Illuminating Skin Polish is suitable for all skin types, so embrace the sun and polish your way to brighter and healthier looking skin this summer.